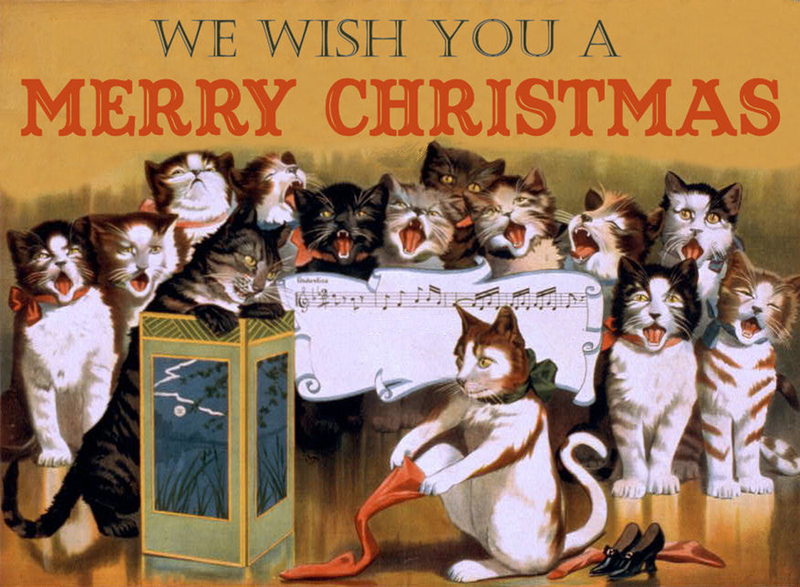 Here we have a fun collection of Christmas Cat Images! Featured here are 9 adorable Holiday Kitties. Included are an assortment of Kitties with Holly Leaves, a Sweet Kitty with a fancy bell Collar and even a photo of a cutey all dressed in her finest Christmas attire. These Free Clip Art Christmas Cats are great to use in your Holiday Crafts, Junk Journals, Collage Projects, Home Decor and more. First I’m sharing this Christmas Holly Cat Image! 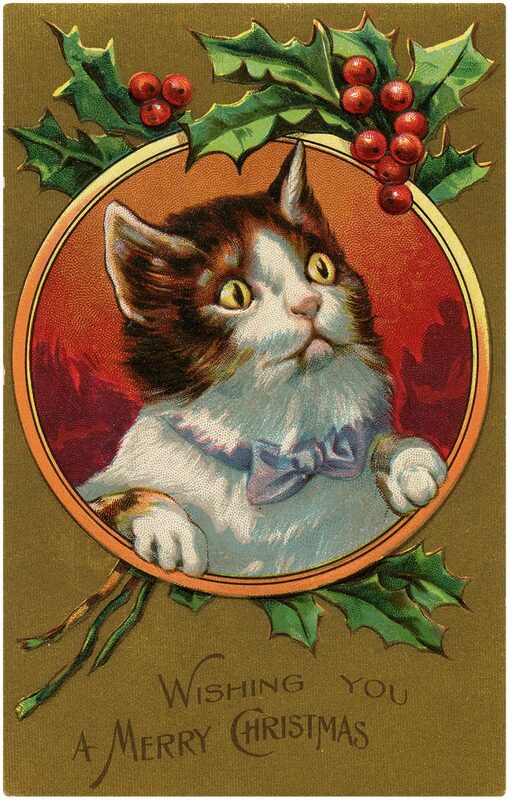 Shown above is a cute old Christmas Card featuring a Sweet Kitty framed up by Sprigs of Holly and red Berries! She’s wearing a green bow around her neck and she has such a sweet expression on her face. I just adore these!! These charming Vintage Christmas Images, show a cute Kitty with a sprig of Holly in it’s mouth. The original is at the top, I’ve also created a second graphic with the words removed. I think it would make a darling Holiday Gift Tag! 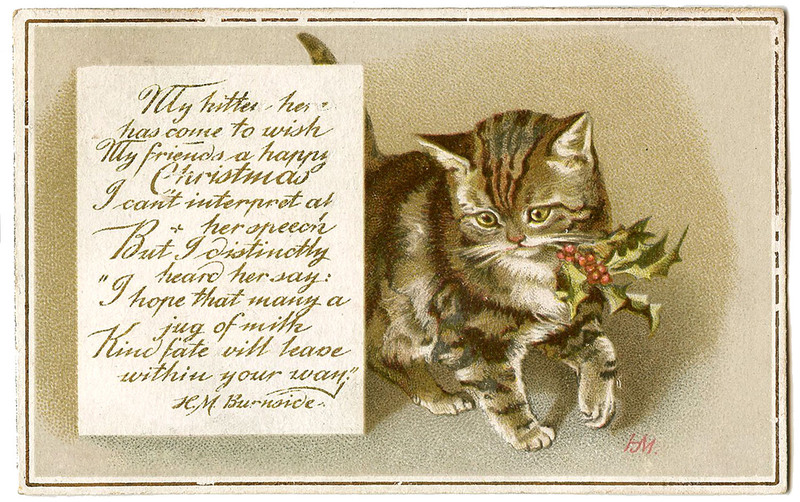 Next I’m sharing this Vintage Christmas Kittens Download! 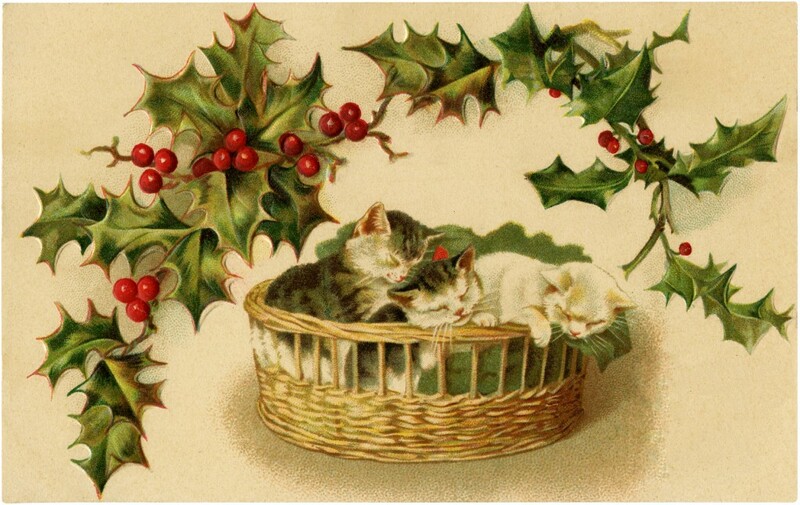 Shown above is a cute old Christmas Card featuring three sleeping Kitties in a basket, framed up by Sprigs of Holly! A nice graphic for your Holiday Projects! 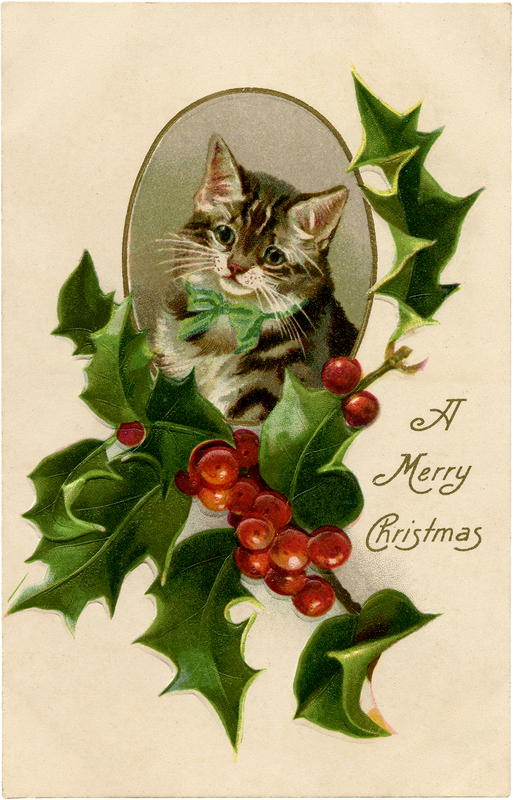 Today I’m sharing this Antique Christmas Kitten Frame Postcard! A cute kitten with wide eyes and white face peeks out of a gold frame on the card. Holly and red berries surround the frame with the sentiment, “Wishing You a Merry Christmas” on the olive background. 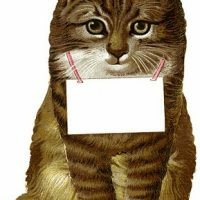 These are some cute Vintage Pictures of a darling little Kitty Cat! She has such pretty Green Eyes and I love her little Bell Collar! I’ve included 2 versions of this, the one at the bottom is the original. I thought the original written message on it was kind of fun, but wanted to include it with out the writing as well, to give you more options. 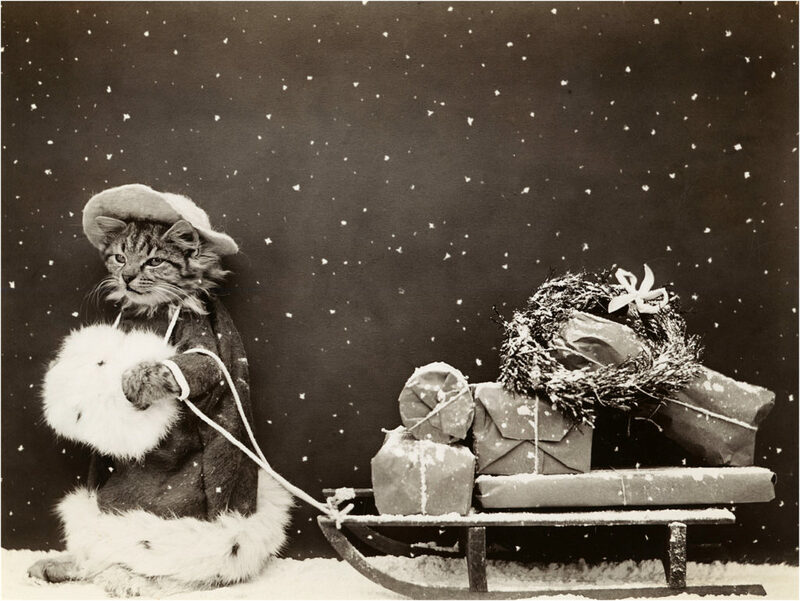 Here we have a Super Cute Vintage Christmas Kitty Photo!! This is such a darling picture! This Old Photo shows a Kitty Cat all dressed up for the Holidays with her Fur Trimmed Coat! She’s pulling a Sled filled with Packages and a Christmas Wreath! Too fun. This last one was one that I posted many years ago. It shows a cute group of Cats Singing! It’s an old Public Domain image that I altered it by adding the words, during one our request days that we used to do here. I hope you liked this set of cute Christmas Cat Images! You might also like our Christmas Dogs Collection HERE. « 4 Cherub Angel Clip Art – Beautiful! Ever thought of posting an image wish list? I have a pretty good collection of cards and would be glad to look for specific things. 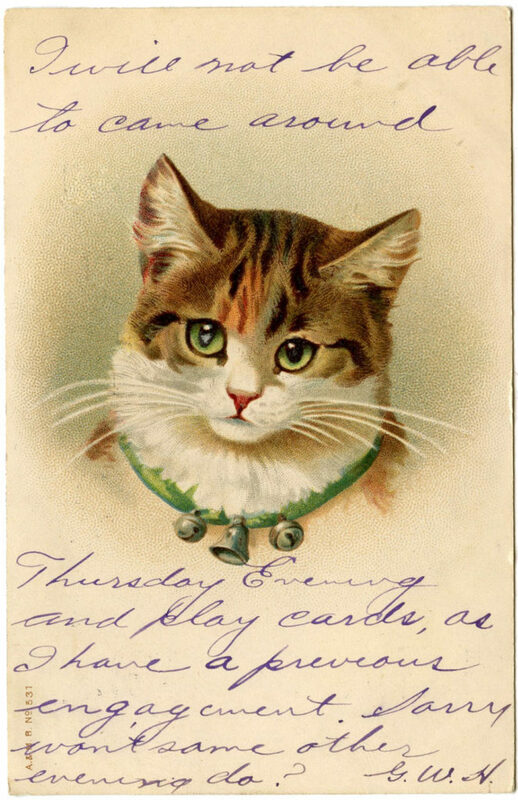 Love the cats and the vintage ad. Thanks for being such a valuable resource and sharing with us. i like the melancholy bride silhouette Karen! I love the Flaming Heart you’re giving away. What a beautiful treasure! Oh, Karen, you are just WONDERFUL!! Thank you soooooo very much for spending time to look for those gorgeous cats. I’m so touched, almost teary with your act of kindness… I know how busy people are during this time of the year. Your act of kindness really brightens my life. May God bless you this Christmas time and always! 🙂 From one of your grateful longtime follower, Music. Great graphics. I love the department store advertisement!! Some of those cats have the funniest expressions on their little faces, love them. Beautiful!!! Thank you for your fabulous images!! Karen, thank you for vintage Angel postcard. What wonderful cats! I have set them as my desktop background. How perfect for the Holidays. Thank you for this and all the other graphics you work so hard to supply. Another great image coming from you. You may like to pop over to my blog. I’ve left you an award. We truly thank you so much for all you do! I couldn’t find a way to just respond to your comment, so I’ll do it here. I have no idea how edit two photos together properly, so I’m disappointed with my blog header concoction. That butterfly clip-art was so pretty and I thought I could find some of old buttons and jewelry bits and such and make a little collage around the edges… I am super excited that YOU might be doing a butterfly header! Again, your work is so, so pretty! The cats are adorable, but I can’t help but wonder why the one cat is putting on a stocking. Great! I’m glad you can use this Kat! Thank you – I have a cat loving friend and I sent the link to her – have a blessed day! These awesome images are all so different and unique! 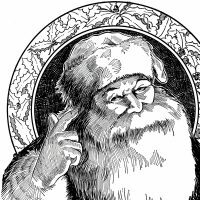 Although I have fallen in love with all of them, my very favourite one is the beauty in the fur, pulling a sleigh full of packages and presents. But all of these are amazing! Thank you for sharing these with us and have a wonderful day!